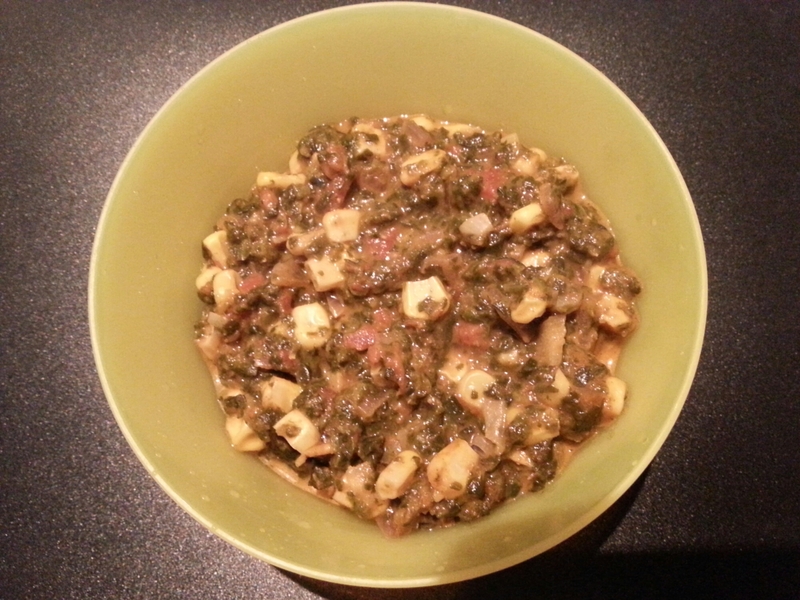 Palak Makai – Spinach corn – Eat, Click, Travel and Repeat! Palak or Spinach is a controversial leafy vegetable! I understand not many eat it . I have always loved spinach. Usually, as a child I have eaten some basic recipes or spinach where it was teamed up with moong dal or potatoes. There is another recipe called Methi malai mutter which is commonly liked and enjoyed. It involves fenugreek, spinach and peas. I plan to write on this recipe for some other day. This recipe is with spinach and corn. Unusual recipe for Indians as corn is fairly seasonal not usually found all round the year. Though, now supermarkets have started showcasing american corn on their vegetable section all round the year. Corn is commonly eaten during the monsoons in India. Corn is called ” butta” in Hindi language. I remember eating spicy, tangy corn charred on coal from any roadside corn seller in Mumbai. The taste is phenomenal and indescribable. Though, I hope to incorporate this recipe as well, in one of the posts later in my blog. I came across this Spinach-corn recipe when I was going through a complimentary recipe book which came along the new microwave oven purchased at our home. The recipe was asked to be made with fresh spinach. I have made this recipe twice now once with frozen spinach and once with fresh spinach. For me personally, it tasted well both ways! Yet, I am choosing to write the recipe where I have used frozen spinach. I have changed and added a few spices. In India, we usually find long leaf spinach, while in Sweden its baby spinach and when purchased in frozen format they are already shredded and in cubes! For faster life, these frozen spinach can be a savior as dinners are cooked quicker. Though, I am aware that fresh ingredients add a whole other dimension to the food in its flavors. If you are going to use fresh spinach leaves, clean them with water, blanch them for 7-8 minutes and immediately immerse them in cold water (ice cubes) for 3-4 minutes. Then blend them with water to get awesome fresh green colour! Add oil to the pan. First add cumin seeds, pressed cardamom, ginger, green chilies, garlic and onions. Saute them till onions are soft. Add tomato puree and fry the mixture till it leaves oil. Add the green spinach to the pan. Stir the mixture well. Add all the dry spices like coriander powder, coarsely cut coriander seeds, and red chili powder. Stir the mixture again. Mix everything thoroughly. Add corn, milk, water, butter and salt. Bring the contents to boil so that corn loses it sweetness and picks up the taste of the spices. Switch off the heat. Spinach corn is ready to serve! We ate this dish with roti and it tasted perfect. It is a perfect gravy dish for any dinner party. Verdict:: All in all, it has loads of flavors in it and goes extremely well with garlic naan or Roti!